We have lived in our home for 19 1/2 years. We moved in when Tessa was 6 months old. When we moved in back then we never imagined that almost 20 years later we would still be living here. But life happens, plans change and you end up with wonderful neighbors you can’t ever imagine leaving. A few years after moving in we decorated our master bedroom. I wanted to create a little garden sanctuary. This is what it looked like. I loved it and I have loved it for about 17 years but it was time for a change. Change is good and since I don’t get a new house I decided a new master bedroom would have to do. 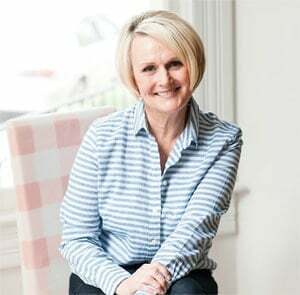 When Glidden® paint invited me to use their My Image Inspiration to redo a room in my house I knew exactly which room it would be – our master bedroom. In a previous post I shared with you my inspiration for the room redo. The look and feel I was trying to achieve. I also shared with you my love/hate relationship with paint. Well, thanks to My Image Inspiration that relationship is now a love one! I uploaded my inspiration image into the system and it presented me with four potential color choices. I decided to go with the Pebble Grey and it was the perfect choice! They hit it on the head the first time. Boy was my husband a happy camper! None of that 10 different colors of paint on the wall trying to decide. Grey can be a bit tricky. I didn’t want a taupey grey or a blue grey – I wanted grey and that is what I got with Pebble Grey, a nice light, grey! 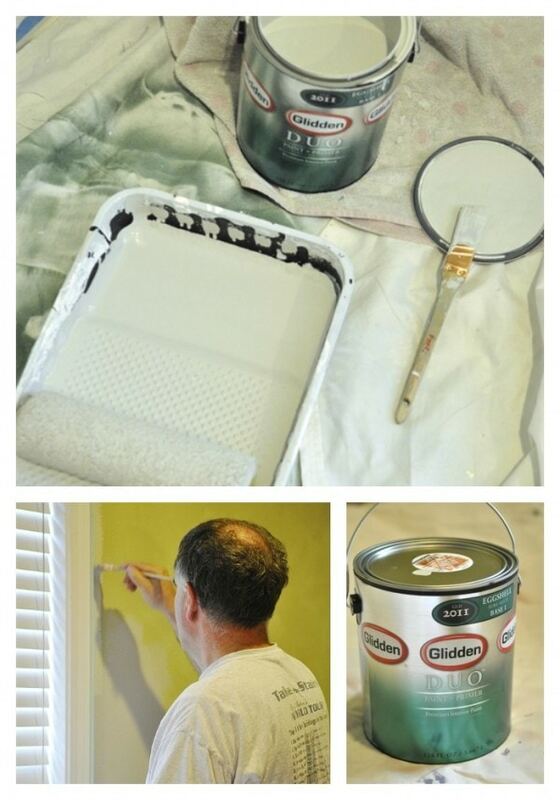 I bought my gallon of Glidden® Duo™ Paint & Primer at Home Depot and we got to work. The paint went on beautifully – so smooth and it covered in one coat! Since the primer is built into the paint the coverage is excellent. My husband really loved that part since he is the designated painter at our house. 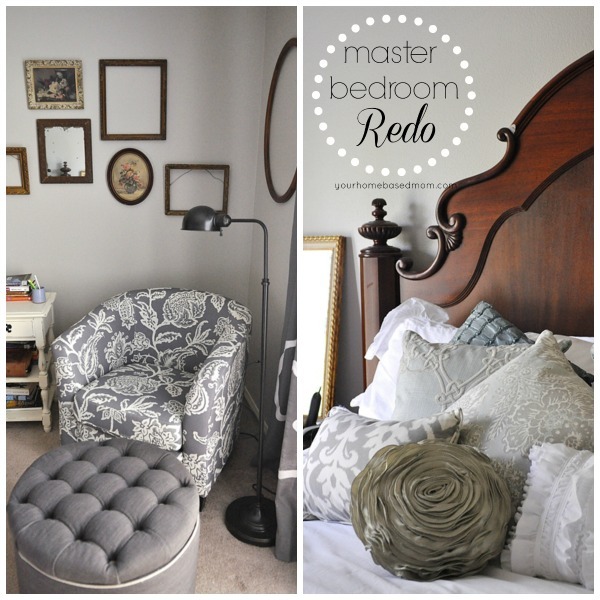 I am so excited to share with you what my new master bedroom looks like today. My bedroom does not have a lot of natural light so taking photographs is a bit difficult but I did my best. The room is still a work in progress as far as the decorating and accessorizing goes but I love it! It feels so calm and peaceful. I decided now that we are empty nesters I could go with all white bedding ala Target (no kids to jump on the bed and mess it up!!!) I brought in the egg colors from my inspiration photo with pillows (TJ Maxx). I love a few pillows on my bed. 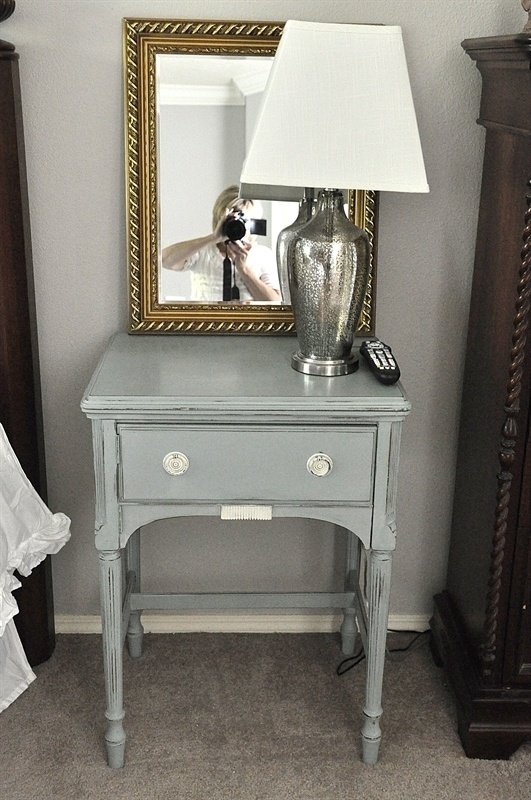 We needed a new bedside table for my husband’s side of the bed so I found an old sewing machine table at Goodwill for $15.00 and gave it a nice coat of paint – the height is just perfect by the side of the bed. I had a collection of gold framed mirrors I had picked up at garage sales over the last few years so I used those on the night stands to open up the room more. 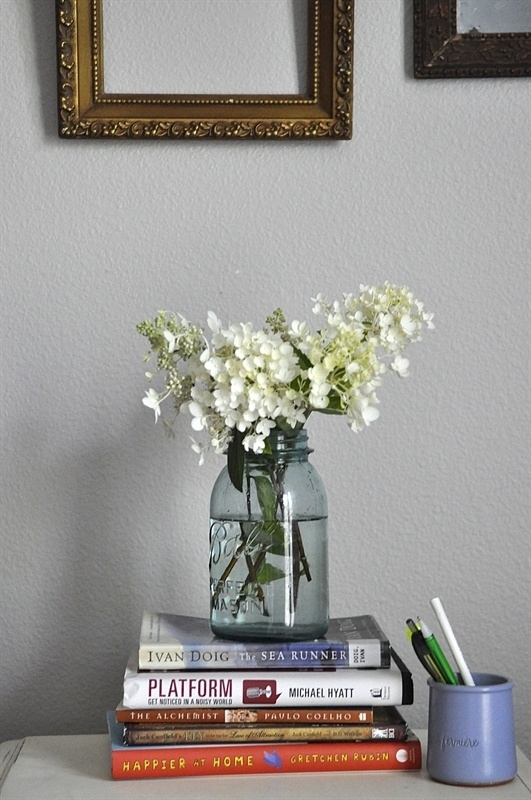 I have a little bit of a “thing” for empty vintage frames so I have used those throughout the room too. My very favorite part of the room is my little reading corner. This is where I start my day with a little reading and devotional time and it is often where I end my day with a little pre-bed reading. The chair is just my size! 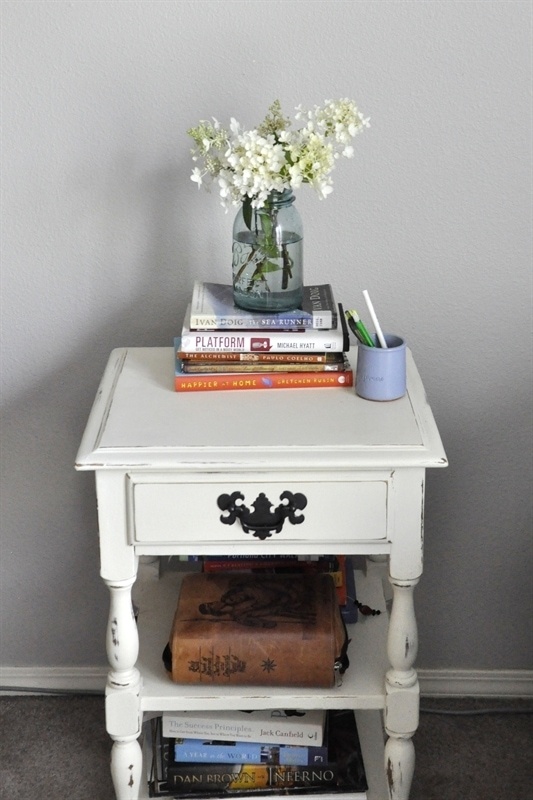 My little reading side table also came from Goodwill for $7.99 and a fresh coat of paint made it “just right.” I also found a good use for one of those yogurt crocks I made my husband carry home in his bag from Paris! It holds my pens and glasses. Here’s a view from the bathroom door. True Confessions: I don’t make my bed every day and in fact I don’t make it most days. Sorry if I have disappointed you!!! But since our Master Bedroom Redo – I haven’t missed a day making my bed! It’s amazing what a new coat of paint can do for a room. So, yes I am pretty much in love with my new room and it is almost as good as getting a new house. And I think this is my favorite corner of that whole house!! Thanks Glidden paint for helping transform my master bedroom and making the process so easy!! BlogHer, Inc. is solely responsible for all aspects of this My Colortopia Sweepstakes, including without limitation the administration and fulfillment thereof. For a chance to win a $100 Visa Gift Card, tell me in the comments which room of your house you would like to paint next! This post is Sponsored by Glidden® paint, but all thoughts and opinions are my own. For more fun bedroom redo ideas check out this! I would paint my bedroom next, the color I chose didnt come out the way I visualized it! I really need to paint my bathroom, it’s dark and a medium burnt orange, hate it. Your room looks great, Leigh Ann! What a beautiful transformation! I’m getting ready to paint my dining room and will check out the color you used for your bedroom as I think it’s a great color! Our laundry room, since the paint has been peeling on the walls for awhile. Leigh Anne, I love your bedroom transformation! Can I ask where you found that adorable little chair? It looks like an Ikea Ektorp, but I have never seen that fabric before. 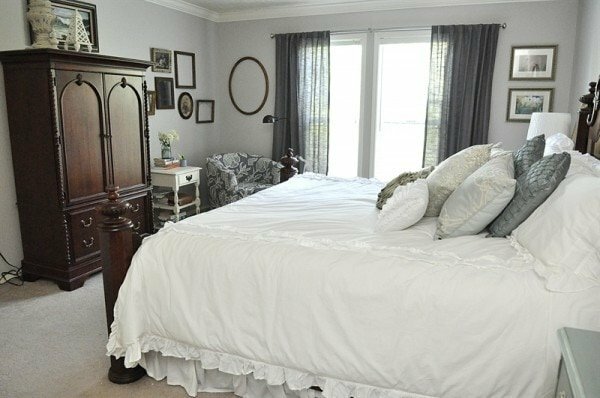 I would love to paint our master bedroom- it still has the wallpaper up from the previous owners, and could use an update! Emily, The chair came from Target and I love it! I need to paint the living room first and then the Kitchen, dining room and then the bedroom. Right now they are all paneled which I hate. We will have to rip it out and put up drywall which will be very costly. i would love to clear the muggy brown from my dining room wall. Does garage walls count? They need a serious refresher! I would love to repaint and redo my dining room before Christmas. We just bought a vacation home and I would like to paint the whole inside! I would love to paint our living room!! My kitchen! It’s the same color and same paint as it was when we moved in 6 years ago!!! My kitchen is in need a major overhaul! Painting would be the perfect place to start! My son’s bedroom. He is nine and whenever he goes to the store with my husband he loves to look at paint colors. He has picked a few WOW colors!! Your bedroom makeover is fantastic. Love the colors. I really need to repaint my kitchen. All walls are wallpapered so it all needs to come off before I can paint. Love the make over. I love having my master bedroom be the most beautiful peaceful retreat! I am ready to do a new color also. Your bedroom looks like a million bucks! Great job! I would LOVE to paint my master bedroom. Embarrassed to say we have lived in our house for 14 years and we never painted that room. You can see where the previous owners hung 4 pictures together because it’s white on those spots. Yikes!!! I would paint my master bathroom. The color I originally chose is too dark and does not go with the tile very well. So hard to tell from a swatch! I would paint the bedrooms. Leigh Ann…seeing your transformation has inspired me to get going on our Master bedroom too. It is plain white, so some color will be uplifting. I love your Goodwill finds and the reading corner!! I would paint my kitchen and family room. they are connected. I would paint Erik’s office, we call it the Mac Lab, since he’s a Human Computer Interaction prof, and other room in our house holds the PC’s. Your bedroom looks great. I need to paint my family room. We’ve lived in this home for 14 years and the color was the original owners red. Yikes! I love the colors you chose for your bedroom. 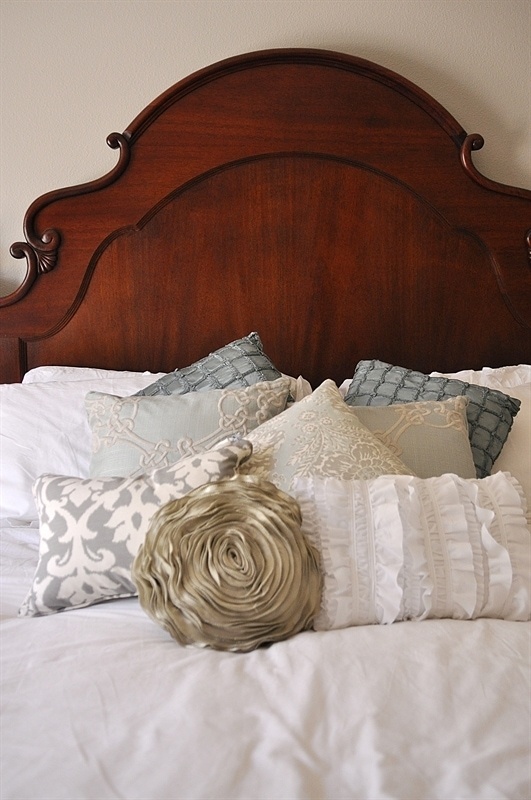 I love the pillows as well–I need to make a trip to T.J. Maxx now! I would also paint my master bedroom. My bedroom and bathroom are a sea of beige and could really use some color. I would paint our guest bathroom. We have never painted this room and I’m sorry we haven’t. It the place where guest visit I would love for it to greet them with a great first impression! I would love to paint the living room and brighten it up. My kids bathroom! It needs help. I need to paint my boys rooms. They still have the basic builder white walls (after 3 years in our house) and they aren’t looking white anymore if you know what I mean! Love your room! LOVE your new bedroom! Gorgeous style lady. You did a beautiful job. Your bedroom is wonderful! You deserve it. I am drooling over your sewing table! I picked one up at a garage sale awhile with plans to paint it grey. Seeing yours was like seeing the vision in my head brought to reality. 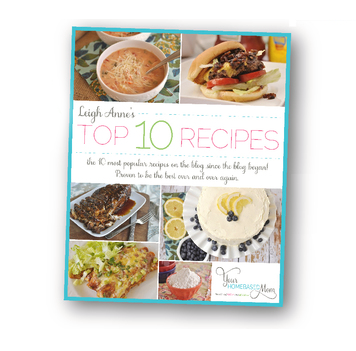 I would love a tutorial as I am now feeling inspired to tackle the project! As for what room I would paint… I really need to paint whole house! 10 years and 4 kids later I would love to start with clean walls again. You did a fabulous job on your bedroom redo. Love the tufted ottoman. I would like to reprint my front living room. Our master bedroom really needs to be freshened up!!! My bedroom, it is a very awful green. I was considering grey, now I am sure, after seeing your bedroom. we just bought a new house so its getting a paint overhaul! I’m so excited! Love your new look! We have been in our current home for about 8 years so every room needs to be repainted, but I would probably start with a bedroom. The upstairs bathroom needs some new color badly! The walls are this pale blue but the prior owners painted the ceiling tan. It does not look great together. I’m in the hunt now for some color in there! Definitely the kitchen/dining room. It is a light taupe and looks pretty blah. I would paint (or should I say, my Husband will) paint our bathrooms. One is green and the other one is a salmon color. We are in need of a change. Love your bedroom redo. Your room is so beautiful and peaceful. What a lovely transformation! I would paint my laundry room. 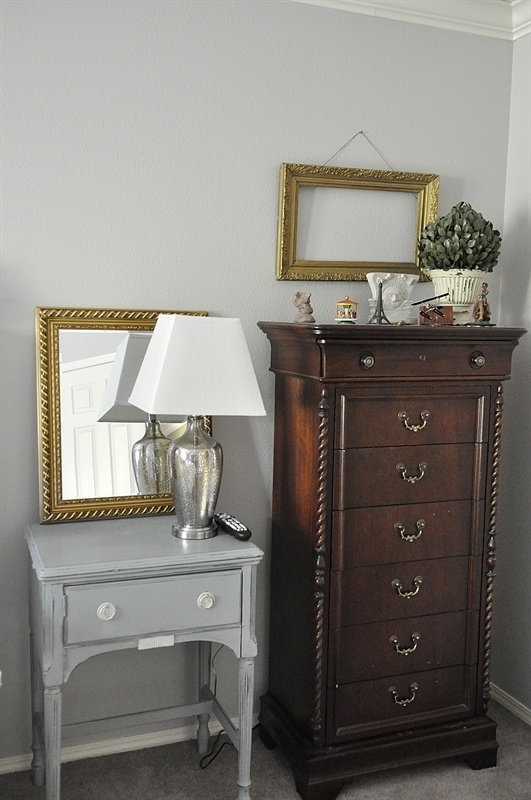 It is a dark taupe color which makes the room really dark to work in! My bathroom is the next room up for painting. Add a new shower curtain and we’re good!! I just acquired a bedroom to paint since our daughter just got married. Looking for the perfect gray as a matter of fact! Your room looks great! 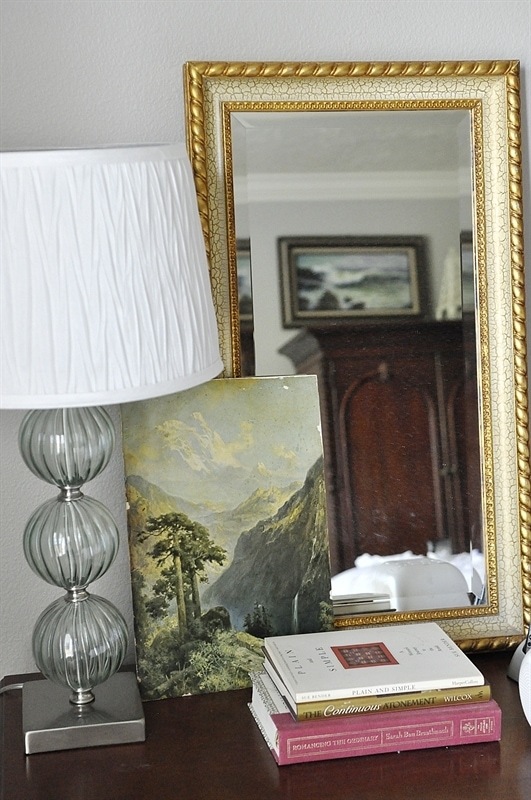 Love your bedroom (how about some of your vintage pictures to fill some of the empty frames. I would paint my living room – tired of white! I just bought a beautiful wisteria for my laundry room. The next room I want to paint is my master bedroom. I am in the process of building a bed. I would love to paint the walls before assembling the new bed in the room. So far every bit of our house is still builder-painted ivory. We are planning to paint our family room. I love your new bedroom exactly how I want mine. My master bedroom is so plain and boring right now. We just bought a house and I am painting everything I possibly can before we move our furniture in later this month. We finished the living room, kitchen, master bed, and basement. Next up is the office and guest room. Everything feels so clean and fresh with new paint! Your room has so many of the exact touches I want to do in our room and a very similar layout, and now I have pictures to show my husband! Beautiful job! Our house is brand new (less than a year old) so it needs paint everywhere to get rid of the builder white! I think I would start with the entry, although there are many spots that are showing little handprints already! WOW – I absolutely love it too! It totally says – calm and peaceful. We’ve never been happy with our bedroom decorations. We painted it shortly after moving in, which is now 8 years ago. And the colors ended up being to similar, except if the room is super well lit. So it just feels dark and dusty. Not to mention we desparately need new future in it. But that is soo expensive. I like how you used the good will pieces. This is very inspiring! So I’d say – I’d love to repaint our bedroom/dressing/bathroom area as it all goes together. Maybe i’ll even show my hubby this post. Maybe it will inspire him as well! I would paint my living room next. Thanks for the giveaway. My kitchen! It’s been five years, I’m embarrassed to say! I would love to paint my bedroom. Thanks for the chance to enter. I would like to paint our computer room next, but we haven’t decided on the color yet. Love what you did with the space! It looks both modern and classic! I would really like to redo my kitchen…big project. If its just paint than I would probably pick the hot pink teen girls room. I told them we would update when they became teenagers, but that happened too fast! I am doing an empty bedroom into a nursery – I already painted the walls (greige), now I need to redo the dresser to contrast better to the walls. Also looking for a rocker with a highback. I would love to paint my family room. It is a hideous cotton candy pink and none of my furniture or decorations match it. 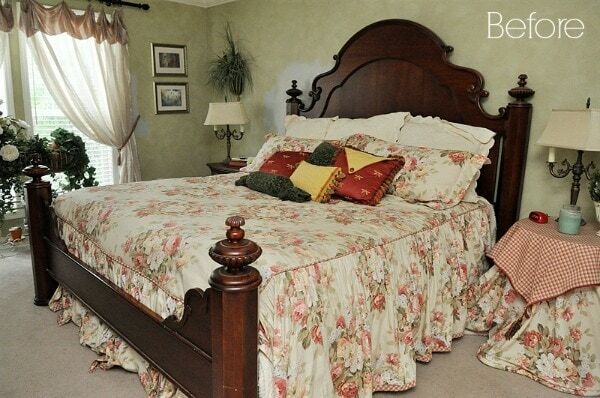 I would also paint the master bedroom……………tired of what I am seeing. Love that chair and ottoman. Where did you purchase the ottoman? I would take off the toile wallpaper in the guest bathroom. It was here when we moved into this house. And then paint the walls – haven’t been inspired by a color yet. I would love to paint my laundry room. It is drab and one of my least favorite chores so it needs a pick me up! My kitchen really needs a repaint, I want it to be bright and current looking. I need to find an inspirational image now! WoW!! Your makeover is beautiful. Love the new colors and the style. I’d love to paint my kitchen, it’s been boring for a while now. Our master bedroom is so dull – I have every intention of painting it very soon! I’d like to paint our bonus room next. We just painted our master bath 2 weeks ago. I am wanting/needing to re-do my sons room. We have been in our home for almost 10 years. He was four when we moved in so he is desperate for a change. He needs a more grown up look and feel. It is currently an old world American look but, with a twin bed, and some cutesy décor. Bless his heart! I would love to paint my kitchen! I am wanting a more neutral color. I adore your bedroom! I have been looking for a grey paint for redoing my living room but have only found too dark or way to light, I love the pebble grey & the primer already in the paint! I hope I can convince my husband to go with pebble grey for our living room. I think it will really bring character to our space. I have been wanting to redo our kids playroom. It’s quite a mess and needs some organization. Some painting would perk it up nice. I want to paint my dining room next. Your bedroom looks very nice…good job! I would re-do or do for the 1st time the computer/craft room. I need to paint all of the kiddos bedrooms upstairs & the tv room. I love your bedroom make-over!! I would like to paint the master bedroom and bath first, and then the kitchen. Thanks for the giveaway! Would love to have the kitchen repainted. I really need to paint my daughter’s room. We are renting, so we can’t paint–but, if we could, I would paint my daughter’s room. I would definitely do my master bedroom as well! I love the gray in your new room! I love the grey!!! I would like to paint our little girl’s nursery so she can have more of a toddler room. Your room looks fabulous! It’s always nice to have a change. I think I’m going to paint our master bedroom next, but I can’t decide on a color. I’m not totally tired of the blue that it is now, but I feel like it needs some freshening up. In our house, I’m the painter and decorator, and make all the redecorating decisions. If it were up to my husband, NOTHING would ever change. Ever. I really want to do at least an accent wall in our bedroom….the white walls are so boring! Master bedroom, think I’ll pick your exact color it is just beautiful!! I would love to paint the master bedroom. Our Guest Bedroom needs a redo, beginning with the paint on walls and ceiling. I would love to repaint our office! I would love to paint my bedroom. It has been a yucky brown forever. I want to reprint my front room and dining room, but I don’t want to do the painting!! I love your new bedroom! It is so peaceful looking. I would like to paint my sewing room or my laundry room next. Thanks for sharing. I love the chair in the corner of your room. Good job, Leigh Anne! I’ve redone all the rooms in my home already–except for one, my laundry room. So that would have to be next to do. Boring! But if I win, I’ll try to make it interesting. Just found your site as I stumbled upon your London wardrobe. Looks like a great trip! I would paint our living room. Its got 1950s wallpaper up…it is so ugly. Our whole house is in desperate need of a makeover! I love the gray chair!! I’m building a new house and will be doing a lot of painting soon. I would paint my girls room so it would look GIRLY. I would love to paint my bedroom! I recently started transforming my dark eggplant theme into a bright greige! On the same path as you!! Thanks for sharing. I would love to paint my bedroom next. How fun! I’d like to paint my bedroom next. I would desperately love to paint our extra guest bedroom. It was a funky shade of green when we moved in and it’s just that last room that hasn’t been touched. Your pics are beautiful! I’m torn between painting my kitchen and my bedroom. I think the bedroom would win though. We did some room switching this summer, and the master bedroom was left in a bit of a mess. Maybe a facelift would help me love it again. Our whole house is new builder white. I would love to add color to any room! I would love to redo our master bedroom too. 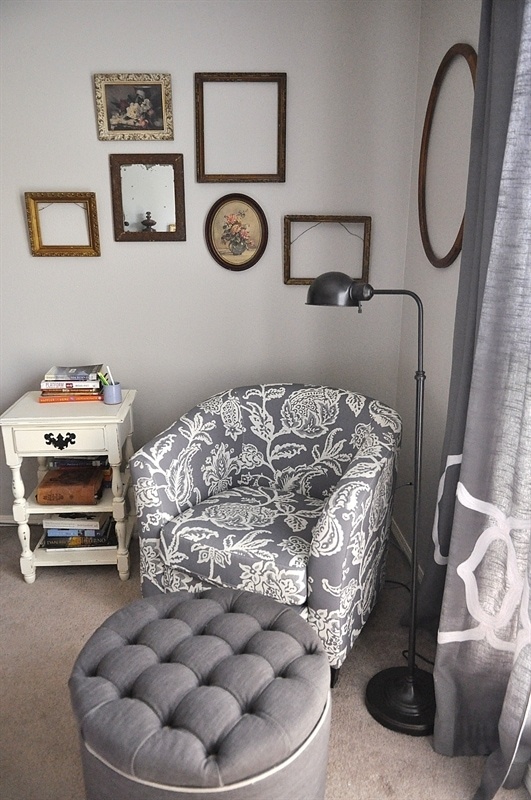 I have always wanted a pretty bedroom with a reading chair in the corner. But as a Mommy of four busy girls, almost everything in our house is here for function not beauty. As a design challenged person, this Gliden website looks like a wonderful tool to help me get some color on the walls. Thanks for the inspiration and helpful ideas. I just bought glidden paint for the living room & need some paint for my bedroom & bathroom. Would love to use this to help with my budget. I really want to paint my kitchen! I have been “planning” to paint for 2 years! Want the walls to be pewter and white cabinets! I love your room and will have to try the Pebble Gray. It’s hard to find a true gray! I am ready to redo my son’s room and want to paint it with gray and orange! If I could choose I would paint our master bedroom/bath. It’s a work in progress but sooner or later it is going to have to be done. I love your bedroom colors, greatly done. The master bedroom! It is almost free of the old wallpaper at last! Thanks for sharing this post! The room looks gorgeous! I would love to give my bedroom an updated and actually decorated look. Thanks for the giveaway. I would love to paint my youngest daughter’s room next. She just began high school so it is time to make her room look like a high schooler lives in there and not a young girl. It would be great to pick out new paint and new bedding! Need to paint our master bedroom! I’d love to give my master bath a fresh new coat. I love how your bedroom turned out. So peaceful and inviting. THis has inspired me to finally paint our Master Bedroom…it’s only been about 20 years, and kids are now gone, so I can decorate any way I want. Love your new “do”. Where did you find the adorable chair? 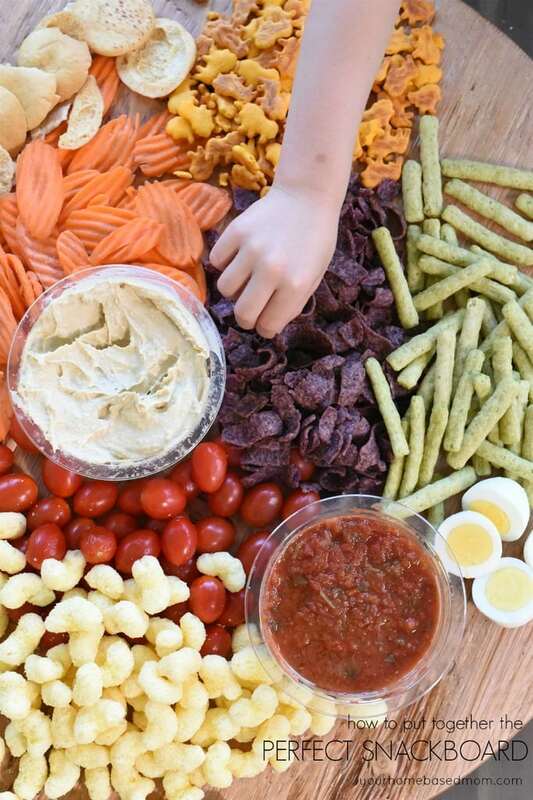 This looks great, Leigh Anne! I love your reading corner. I have one in my bedroom too. I would like to paint my daughter’s room next. I would love to paint my breakfast nook a nice sunny yellow. We bought our house 3 years ago and it’s the last room that needs to be painted. My mom died of lung cancer last year and we use the space for her hospice ccare since she couldn’t go up the stairs to a bedroom. I feel like a clean coat if paint and some cute furniture would help me making fresh start and forget some of the hard memories that space holds for me now. Were in the process of redoing our basement after a flood so Id love to repaint it! We are planning to paint over a horrible orange dining room and entry way! I would love to make the living room more colorful! Our master bedroom needs a makeover! I love the shade you chose. Grey’s are so fun to work with aren’t they? Thanks for sharing your experience! Your room looks fantastic. I so want to paint my master bedroom next. 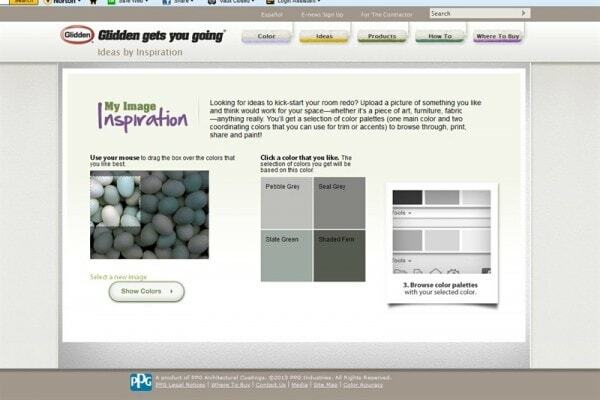 Thanks for the inspiration and for sharing Glidden’s color tools. Thanks also for chance to win. I want to paint my kitchen the color I want it once and for all. But also our living room has one brown wall that I am not in love with. Maybe I’ll just do both! Our kitchen! The previous owners tried to match the original color but didn’t quite make it–it comes off as purple in some areas instead of tan! I want to paint my girls’ bedroom a new fresh fun color. Thanks! I would love to paint our family room. It’s off-white now–and boring! Love your bedroom makeover. Thanks! I really want/need to paint our bathroom! I would paint my front room. Off-white is nice, but super boring! It needs a much “homier” feel to it. I love the new grey colors in your bedroom. I would also paint our master bedroom. I love the grey!!! 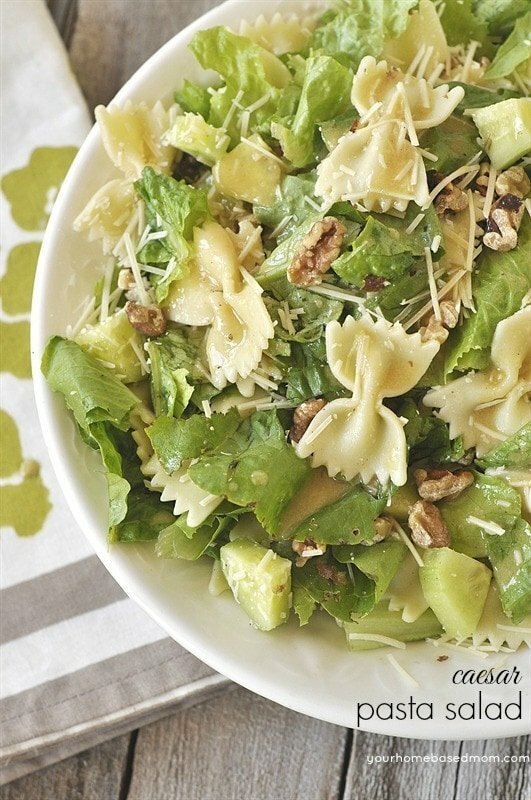 I would throw in a little yellow in mine as well…Currently i have celery on the walls and am wanting something a little more softer…you have given me inspiration! I would love to paint my bedroom! Love it! I need to paint the bathroom…its bright renters white and we have left it that way for 5 years since we bought the house. I’d love to paint my daughter’s room next but it will be quite a chore because she has this bed with drawers that we’d probably have to take apart to move it! I’m looking forward to painting and decorating my shorties’ bathroom! I would love to paint my family room! 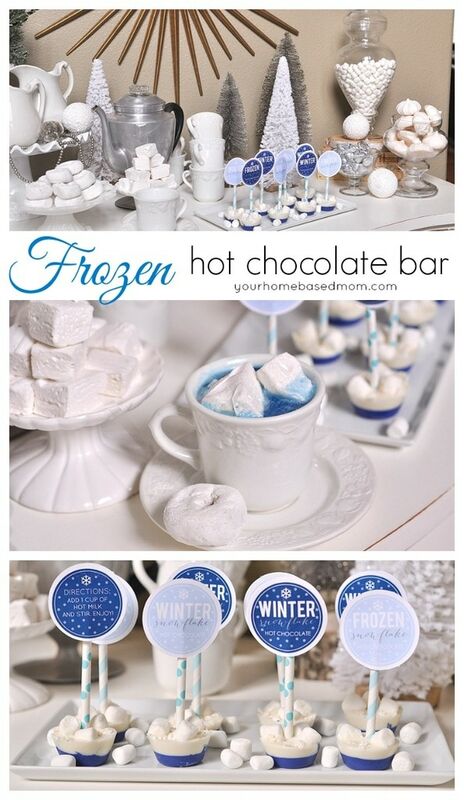 I am really tired of the color and want to start with a fresh pallet! Within the last year, we have repainted nearly every room in the house…except the master bedroom because we could not decide (or agree) on a color that we would both want to live with every single day. I change my bedspread often, so I am afraid of picking a wall color that would limit my options for bedspreads. Basically, I am too indecisive and I don’t know if I will ever settle on a color…so either my walls will remain white, or I will begin changing the wall color as often as I change my bedspread. I would like to paint my laundry room. My Master! I actually came across your blog because i’m looking to do gray and am stumped on what color gray. I love your choice!!! Would love to use this $$ for the project! Thanks! I would to paint my master bedroom also. It too is outdated and needs a fresh new look and feel! I want to paint my dd’s room next. I would love to paint and redo our master bath – it still has ugly wall paper with roses on it from the previous owner! The kitchen, it needs new color since it is the hub of our home. I would love to paint my bedroom a deep, rich plum. Not everyone’s color of choice, but I love color. We just bought a fixer-upper…so every room needs repainted!! Would love to win this card! Without a doubt the master bedroom! Beautiful makeover! 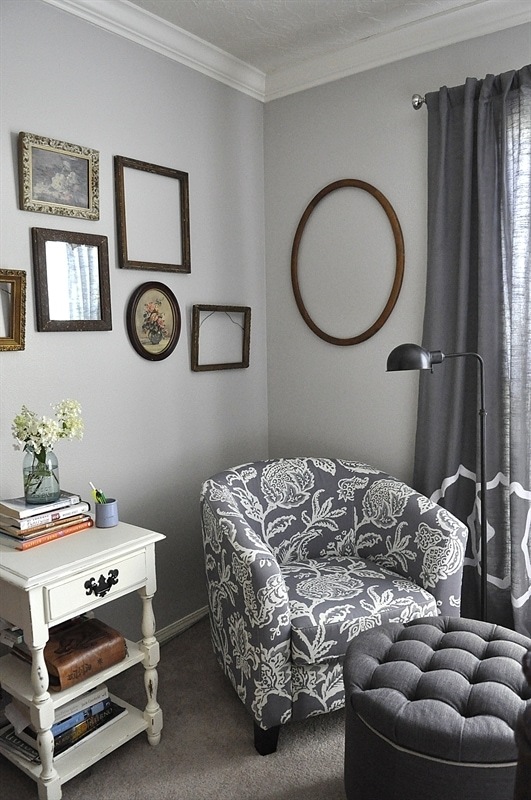 I absolutely love your reading corner and the empty frames. It looks like such a relaxing room! Beautiful bedroom!!! I would love to re due my daughters bedroom. That’s next on my list. The timing would be perfect for me to win this – I’m in the middle of painting right now! I love the color you chose. I’d love to paint the family room next. 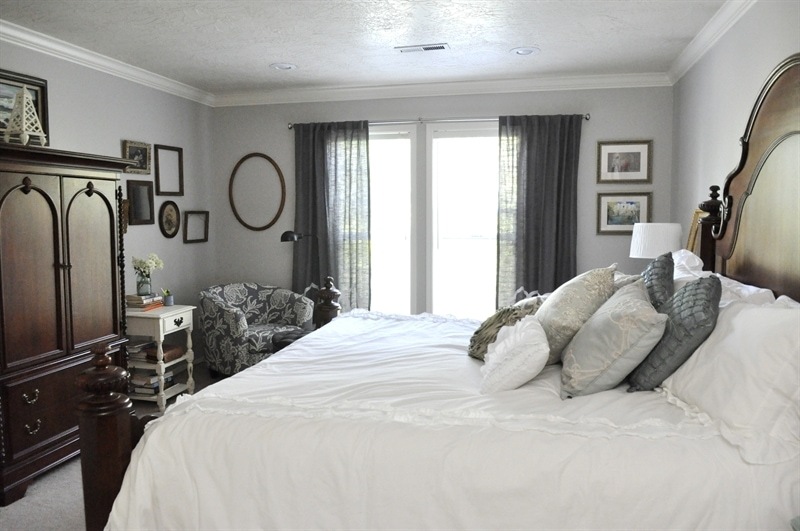 Bea Long "The Bayou Lady"
https://www.yourhomebasedmom.com/master-bedroom-redo-reveal/ … I love this and I NEED to re-do mine so bad. It has been years. I worked night shift for 25 years and so my bedroom never got any attention. It is about time to do something for me….just me. Our bathroom could use an update! My children’s bathroom has never been painted and could really use a fresh look! Thank you fo doing this! I would like to paint the entryway of my house. It has yucky peeling wallpaper. I would love to paint the kitchen in my house next. I love the new color in your room. So elegant and pretty color. Very inspiring. I most need to paint my living room but every room could use new color. My bedroom could use a painting. I really need to paint my kitchen! I am about to move into a new home so EVERY wall will need a nice fresh color! 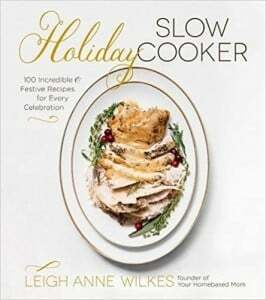 Thanks, Leigh Anne! I am going out right now to get a sample of Pebble Grey for my front entry! Hi Leigh Anne! Even though this looks like you posted it a few years ago I still LOVE you bedroom and would like to know which chair it was you purchased at TARGET and also where you got the ottoman. I’m in the process of moving and think I will have the perfect corner in my new master to replicate what you have done. My current bedding would match the grays you found! My fingers are crossed they are still available=) Thanks so much! Kim, The ottoman and chair are both from Target. I found them online.